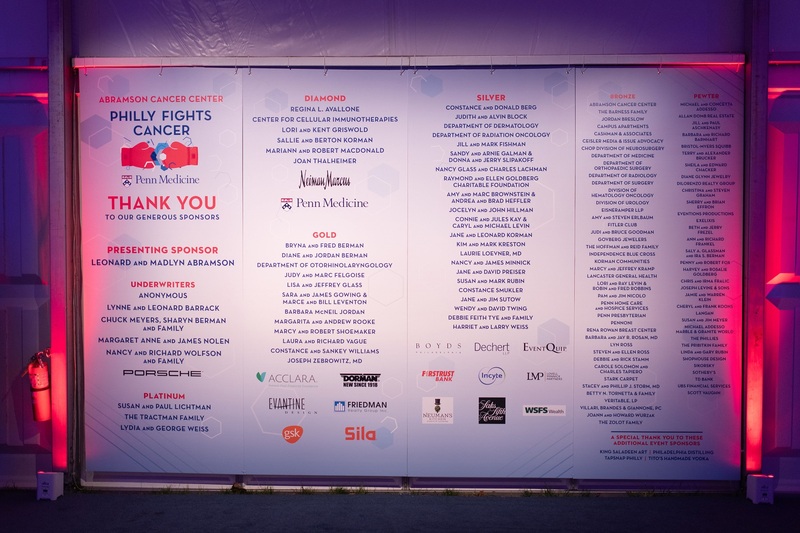 As the highlight of Philadelphia’s social season, the Philly Fights Cancer: Round 4 Gala did not disappoint! Just a few weeks ago at the Philadelphia Navy Yard, in a giant tent built during monsoon-style conditions, 1,850 Philadelphians came together to raise close to 10 million dollars for the charity! It was the perfect collaboration of planning, creativity, talent, and immense generosity! As the event producers, we thank everyone, from the planning and production teams to the amazing performers and guests, for their hard work and heartfelt dedication to Philly Fights Cancer. This year’s star-studded special event featured a hilarious performance by comedy icon Jerry Seinfeld, followed by a-rockin’ after-party concert from Grammy Award-winning pop superstars Maroon 5. As well as an emotional performance from Philadelphia’s chanteuse and cancer survivor, Jessy Kyle. Get a serious dose of fundraising energy from auctioneer Harry Santa-Olalla, put Six-time Emmy award-winning television host, writer and producer Nancy Glass at the podium, let Nicole Cashman run the media relations, and then add plenty of delicious food expertly served by Neuman’s Kitchen, and you have the recipe for gala success! But the gala is not just about celebrity performances. The real celebrities honored at the gala are the doctors working to eradicate cancer by showcasing the stories of survivors saved as a result of the groundbreaking medical advances of the Abramson Cancer Center. This year’s honorary physician was researcher Dr. Carl June, the Richard W. Vague Professor in Immunotherapy at Penn Medicine’s Abramson Cancer Center. Dr. June was recently named to TIME Magazine’s 2018 TIME 100 – its annual list of the 100 most influential people in the world – for his breakthrough CAR-T cell therapy. Last year, the FDA approved Kymriah™ (formerly CTL019) for pediatric leukemia, and Dr. Carl June and colleagues at Penn continue to lead the immunorevolution to expand this life-saving therapy to other cancers. The treatment has been deemed a “miracle drug,” and its approval was referred to by the FDA as “historic action.” The New York Times called it “a milestone that is expected to transform treatment.” Incredible, right? A real-life celebrity working miracles for us all thanks to the generosity of Mr. and Mrs. Abramson, shown below with Dr. June. Philly Fights Cancer’s gala co-chairs were once again, two of the most inspiring women we know, Nancy Abramson-Wolfson and Missy Dietz. Additionally, this year’s honorary event chair was Sean Parker, Founder, and Chairman of the Parker Institute for Cancer Immunotherapy. The Institute was established in April 2016 through a grant from the Parker Foundation, which brought together six institutions across the United States aimed at accelerating the development of breakthrough immune therapies – including a Penn Parker Institute. Leading the charge for the next generation, Stephanie Wolfson and Paige Dietz served as co-chairs for the Young Friends of Philly Fights Cancer. Adam Levine & Maroon 5 Bringing Down the House! No one does 15 minute pledge drives like Harry! 1800 guests means a room filled with screens! A Limited Edition Porche that raised $440,000! Planning, coordination & communication, the secrets to a successful event! The list of generous sponsors! The generosity of Porsche was amazing! The best photo props in town! Keeping the decor simple and keeping the focus on the program itself. Guests enjoying the cocktail reception. Guests making their way to their dinner tables. No job is too small for Brian Kappra! Staging, lighting, sound & talent management, all by TeamEvantine! We thank Mr. and Mrs. Abramson for their vision, determination, and generosity. We wouldn’t be here, four years running, without their imagination. Additionally, we offer deep gratitude to the hardworking and talented event partners, vendors, artists, and performers who helped bring this event to life. Especially Tyler Boye for this incredible images, EventQuip, Neuman’s Kitchen, Cashman & Associates, and our own #TeamEvantine. It’s impossible to thank each one of you, but know we appreciate every contribution! We will be sharing additionally posts on the behind the scenes creation of this massive event, as well as on the beautiful food service crafted at the event by the dynamic culinary duo Chefs Robb Garceau and Thomas McMullen, as well as and Jan DeMarzo from Neuman’s Kitchen. Stay tuned! Goodie Bags for the guests!